In what’s possibly Google’s most significant change to their search-engine algorithm (in terms of how many sites it will affect), we’re about to see companies of all sizes drop off mobile search results. 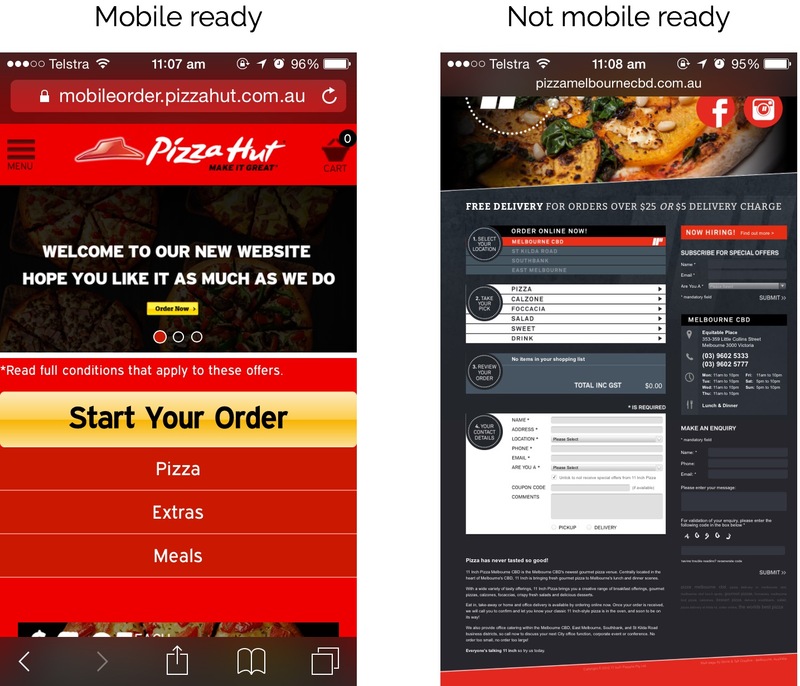 From little corner stores who rely on promoting their business, to giant national companies like Domino’s, there are going to be significant consequences for neglecting a mobile-optimised website. So what’s the change? Google are doubling-down on mobile, to ensure that people using their search engine are provided with not only relevant search results, but a good experience. Google doesn’t want people searching from their smartphones to view websites that are clunky and unreadable (that is, sites not optimised for mobile). As a result (from our prediction a month ago), Google are officially rolling out a “mobile-friendly” badge to all websites. More importantly, websites that Google doesn’t recognise as “mobile-friendly” will now be flagged as providing a poor user-experience. The implications of this are massive, as Google will aggressively start penalising (deranking) websites that don’t have mobile websites. Example of a mobile-friendly website. Example of a non mobile-friendly website. Nobody likes searching for important information, only to find that when they navigate to the website it’s unusable. Imagine you’re ordering pizza one Friday night off your iPhone, for you and your family. The first two results that come up on Google are different. One has the “mobile-friendly” badge, the other doesn’t. This lets people immediately determine whether they should even go to the site or not. If the badge is not there, they know not to waste their time on a website that is not usable on mobile, therefore making the mobile-friendly site a lot more attractive. This is how Google see it too. But Google on the other hand want to aggressively take websites that aren’t optimised for mobile off the first page of search results. This leaves website owners with no option BUT to make their website mobile-friendly. Otherwise, pay the price and lose customers when Google takes them from the limelight on the first page, to a little corner backstage. The bottom line is that Google want to provide people with the best possible search results. Not just results that are relevant in terms of the keywords typed in, but websites that are specifically made to work well on all devices. The fact of the matter is that Google has a monopoly when it comes to search engines. Over 88% of ALL web searches are Google searches, pretty much cutting Bing and Yahoo out of the picture. What this really means, is that it’s essential to keep up with Google’s search criteria. 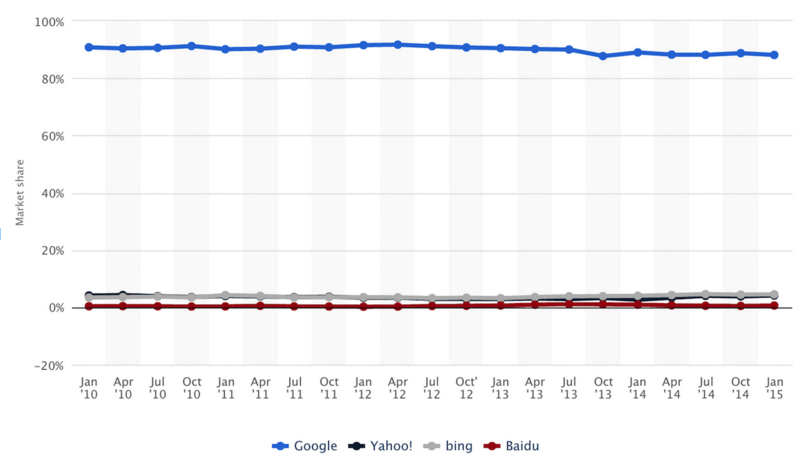 You don’t have the option to fallback on Bing or Yahoo, because the volume of searches is far too low. 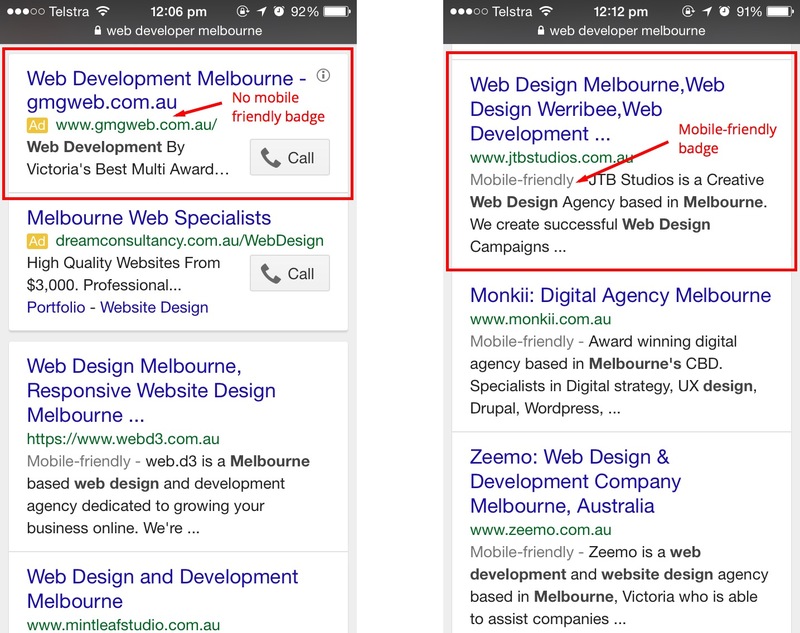 The (sort of) good news is that for time being, Google have decided to omit the Mobile-friendly badge for paid-ads on mobile search results. Due to the nature of Ads (paying to be put at the top of the search results), there’s a conflict when it comes to this new mobile-friendly way of ranking websites. With that said, though there aren’t any immediate downsides if you’re running Google Ads, there’s sure to be in the coming months. Whether it’s Google simply displaying the mobile-friendly badge on ads (deterring even more people from tapping the Ad), or making the CPC (Cost Per Click) rate higher for non mobile-friendly sites (because they provide a poorer experience to users), only time will tell. But given Google’s focus on mobile, and track record for releasing fundamental changes to their search engine, don’t expect to be in the safe zone for much longer. The growth of smartphone use has skyrocketed over the years, to a point where all you need to do is look around, and count for yourself how many people have their smartphones out. There are around 2 billion people using PCs in the world, and more than 5 billion who use mobile devices. The problem? The percentage of PCs that have internet access is much higher than mobile devices, therefore leading to less search-traffic on mobile than desktop. With that said, mobile searches now take up 30% of all searches worldwide. It’s predicted by Matt Cutts from Google, that mobile search traffic will exceed desktop search traffic by the end of 2015. That’s an ambitious 20% increase in search traffic! But the data doesn’t lie. 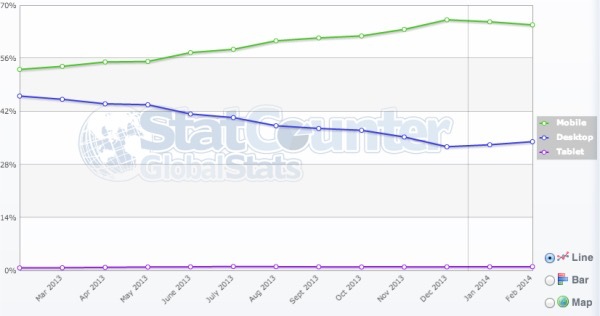 Historically, over the past 2-3 years, while mobile searches go up, desktop searches go down. It’s no longer the early 2,000s, when it took minutes to load a single web page using dial-up. In fact, in Australia, 4G outperforms plugged in internet connections in many cases. With all of the new technology available, the cost of providing internet services is dropping dramatically. In fact, big companies like Google and Facebook have realised this, and they’re taking massive action to get more people all around the world online. We are actually on the verge of freemium internet being provided all around the world. Yes, internet that people do not have to pay a cent for (well, technically). For example, Facebook’s Internet.org initiative, that provides people in third world countries access to popular websites like Facebook, Google Search, Messenger and Wikipedia FOR FREE. Initiatives like Project Loon from Google, which will beam down internet to potentially billions of people, at a very low cost (or no cost at all). And their free public WiFi service for New York citizens (which will surely expand all over the world once it has been established in NY). These companies want AS MANY people as they can to have access to the internet. Facebook and Google may be giving people free-access to their services, but they’re making it back on the amount of Ads that will be shown to billions of new people. This is good news for you. The more people online, the more potential customers you have. Remember this: mobile isn’t just the future, it’s the present. The usage is growing rapidly, and Google will only continue to push companies towards making their sites mobile-friendly. It’s not worth the risk avoiding a mobile-friendly website, because you might just vanish overnight. If a sizable amount of your customers come from mobile-searches, and all of a sudden your ranking drops, you’re going to make your bank account one unhappy camper. So, interested in seeing if your website is mobile-friendly? Check with Google’s official tool here.